If you are a business advertising goods for sale.. If you are a business advertising services (eg Activities, Childcare, Mums Classes & Groups, Party Venues & Entertainment, Photography, Tutoring & Education).. If you are a business and would like to advertise on our banner or sidebar.. Highly Targeted Audience - Our website is specifically for parents. Only people looking to buy or sell something related to children use KidsLocal, so you can be confident that the right people will be looking at your ad. Flexibility - You can edit your ad at any time, even after it’s been published. Simply visit your personal dashboard and select to Edit your ad. You can also add up to 3 pictures and list your website to get maximum exposure. Performance Tracking - Monitor your ad’s performance through your own personalised dashboard. This gives you visibility into how many times your ads have been been viewed. Build your business - Many of our users search by postcode to find businesses local to them, and by adding your website url to your ad you make yourself more visible to your market. We also have a growing network of followers on Twitter and facebook, and provide a great resource for mums and dads – we are loved by parents! 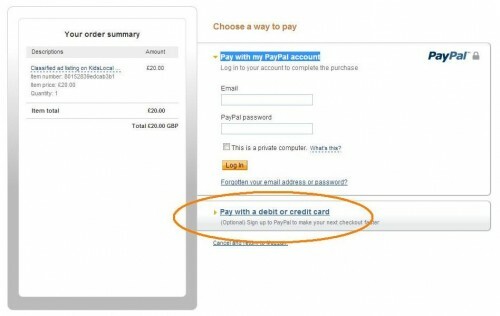 Yes you can pay directly by credit or debit card - all you need to do is select PayPal as the payment option, as this allows you to pay directly with a card without actually needing to create or have a PayPal account. You can attach up to 3 pictures to each ad, and can edit your ad at any time (even after it’s been published) through your Personal Dashboard. Users will not be able to purchase your items for sale directly through KidsLocal, they will either contact you directly (via the contact form on the right or your ad) or through your website or any contact details you list with your ad. If you are a business advertising services such as Children’s Activities, Childcare, Mums Classes & Groups, Party Venues & Entertainers, Photography, or Tuition & Education, you need to register and submit your ad under the “Services” Category. You can attach up to 3 pictures, a link to your website, and any details including price and contact information. Ads in this category cost £40 per listing and will be valid for one year. Please allow up to 48 hours for your ad to be upgraded to an annual listing after submission (your listing will be submitted for 90 days and we will upgrade it to annual within 48 hours). If you would like to advertise on our banner, sidebar, or footer of our site please get in touch for our rate card. You can contact us here, or send us an email at support@kidslocal.co.uk. If you feel that the appropriate category for your listing is not available, please Contact Us. © 2019 KidsLocal. All Rights Reserved.